Let me know what you think of my "green clunkers" made from recycled car parts. In 1971 I began studying ceramics, later bronze and stained glass. I began blowing glass in 1987 at Palomar College with Val Sanders and Barry Reed. I opened Lowell Duell Glass Art in 1989 and continued my studies at Palomar as well as studying torch work with Grant Randolph. In 1994 I assisted in the design and construction of "Kroakers Studio" in Vista, California. Through the years I have worked with many artists, continually studying new techniques or just building and repairing equipment. 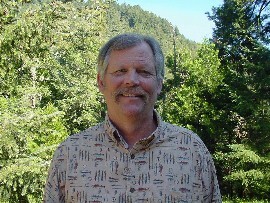 In 1995 my wife, Susan and I built our own private studio in Roseburg, Oregon and named it "Meadowlark Studio". We have recently relocated the studio to Glide, OR and renamed it "Serpentine Glass". I create all my own designs, exploring the fluid nature and optic properties of glass. I do not specialize in any one aspect of glass production, instead design and create numerous types - vases, plates, and sculptures of solid glass, paperweights, perfume bottles, and other works. I try to introduce something new in each piece - a color, shape or design, working with techniques developed centuries ago. My paperweight series include: Sea flowers, Shrooms, Veils, and Jelly fish. My most recent series of paperweights is called "coral reef". These detailed little "aquariums" are created using individually sculptured sea life designs encased in clear crystal. I blend colored glass with thick cylindrical glass cane for the coral reef setting. With a special hand torch, I might add a starfish, seaweed, or tropical fish, making each paperweight different from the next. My newest blown forms are "glass balloons". I liked the name so much I bought the web name, it links to my web site. They are inspired from my childhood when we lived on Kodiak Island in Alaska and combed the beach for glass balls that always ended up in our yard. The globes display well on a simple staff made of wood (dole from a hardware store) or metal rod (from a steel suppler) or I can always ship you one. They can withstand all types of weather and can remain outside year round. My works are included in numerous private collections nationally and internationally (Australia, Cyprus, Germany, and England). Many galleries carry my glass art throughout Oregon, California, Arizona, and Colorado. I display my art at festivals in Salem, Portland, Belluve, Boise, and Roseburg. I have won numerous awards for my art work. Anacortes Arts Festival Anacortes, Wa.